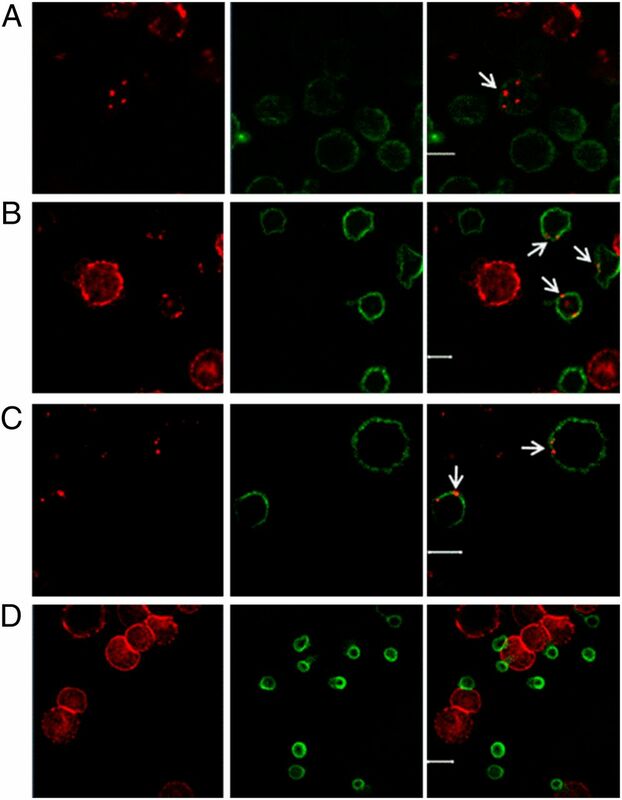 Trogocytosis is a contact-dependent intercellular transfer of membrane fragments and associated molecules from APCs to effector lymphocytes. We previously demonstrated that trogocytosis also occurs between tumor target and cognate melanoma Ag-specific cytotoxic T cells (CTL). In this study, we show that, following trogocytosis, immune effector cells acquire molecular components of the tumor, including surface Ags, which are detectable by specific mAbs. We demonstrate that CD8+ and CD4+ T cells from melanoma patients’ PBMC and tumor-infiltrating lymphocytes (TIL) capture melanoma Ags, enabling identification of trogocytosing lymphocytes by staining with Ag-specific Abs. This finding circumvents the necessity of tumor prelabeling, which in the past was mandatory to detect membrane-capturing T cells. Through the detection of melanoma Ags on TIL, we sorted trogocytosing T cells and verified their preferential reactivity and cytotoxicity. Furthermore, tumor Ag–imprinted T cells were detected at low frequency in fresh TIL cultures shortly after extraction from the tumor. Thus, T cell imprinting by tumor Ags may allow the enrichment of melanoma Ag-specific T cells for research and potentially even for the adoptive immunotherapy of patients with cancer. The key to successful adoptive cell therapy of metastatic cancer is the generation of tumor Ag-specific cytotoxic T cells (CTL) capable of targeting and destroying the tumor. The major challenge of this approach is the ability to identify and isolate a specific CTL population with a spectrum of Ag specificities (1). Recently, it became evident that the interaction between CTL effector and target cells goes along with an exchange of cell membrane material, a process denoted trogocytosis (2, 3). Trogocytosis is a contact-dependent intercellular transfer of membrane fragments and molecules, originally described in lymphocytes (4). It involves all types of immune cells, including B cells, CD8+, CD4+, γ-δ T cells, and NK cells, while interacting with professional APCs (5–9). During this process, molecules localized in the adherence plate formed between an APC and an immune effector cell are transferred from the former to the latter. As a result, the recipient cell acquires membrane fragments containing molecular components of the APC. These molecules comprise a diversity of cell surface receptors and ligands. For example, the transfer of MHC class II, programmed cell death ligand 1, CD80, and HLA-G from target cells and its subsequent effect on the capturing effector cell have been documented (6, 10–13). We and others have described trogocytosis between melanoma-specific CTL and their cognate tumor targets (11, 14). Our studies have shown that CTL populations integrating melanoma membrane patches on their surface have stronger cytotoxic activity than nontrogocytosing lymphocytes (15). We suggested that the detection of trogocytosis-capable T cells could be used for the isolation of lymphocytes for potential therapeutic application. Beadling and Slifka (16) were the first to propose that trogocytosis may be used as a tool for recognizing and monitoring Ag-specific T cells. They named their approach T cell recognition of APCs by protein transfer. T cell recognition of APCs by protein transfer is based on prelabeling of target cells prior to their encounter with T cells, thus enabling detection of a full range of reactive T cells. However, the assay cannot be performed in the absence of an antigenic protein loaded onto prelabeled APCs. Similarly, we and others (15, 17) have used tumor cell prelabeling to detect cognate T cells regardless of their particular specificity. For all these assays, the availability of tumor cells was mandatory. An alternative way to monitor tumor-reactive T cells in the absence of tumor is to rely on T cell activation markers (1, 18). However, these markers do not only detect tumor-Ag–specific lymphocytes, but also all other activated effectors. In the current study, we outline a direct approach for identifying tumor-reactive T cells. We assumed that CTLs interacting with melanoma cells would trogocytose a variety of tumor Ags. Acquisition of membrane components by CTLs should confer them expression of melanoma Ags. Thus, instead of tracing an artificial label acquired from a prestained target, we searched directly for easily recognized, natural components of the tumor. Our results show that, following trogocytosis, several melanoma Ags were detected on lymphocytes, and that these Ag-imprinted lymphocytes could exert enhanced melanoma-specific cytotoxicity. We therefore suggest that T cell imprinting with tumor Ags can be used as a tool for the detection and isolation of melanoma Ag-specific CTLs with improved tumor-killing capabilities. Melanoma cell lines M171 and M579 (HLA-A2 negative) were established at the Sharett Institute of Oncology, Hadassah Medical Organization (Jerusalem, Israel) (19). The M579-A2 clone is a stable HLA-A2+ transfectant of M579 cells, which expresses HLA-A2 following transfection with pcDNA3-HLA-A2 plasmid. The 624mel (HLA-A2+) was a gift of M. Parkhurst (Surgery Branch, National Institutes of Health, Bethesda, MD). All cell lines were cultured in complete medium consisting of DMEM supplemented with 10% FCS, 25 mmol/L HEPES, 2 mmol/L glutamine, and combined antibiotics (all from Invitrogen Life Technologies). Table I summarizes data on the melanoma cell lines used in this work. T2 is a TAP-2–deficient lymphoblastoid cell line of HLA-A2 genotype. The study was approved by the Institutional Review Board, and all patients gave their informed consent prior to initiation of melanoma and lymphocyte cell cultures. Tumor-infiltrating lymphocyte (TIL) microcultures were initiated and expanded from tumor specimens taken from resected metastases of melanoma patients, as described (20). Lymphocytes were cultured in complete medium consisting of RPMI 1640 supplemented with 10% heat-inactivated human AB serum, 6000 IU/ml human rIL-2 (rhIL-2; Chiron, Amsterdam, The Netherlands), 2 mmol/L l-glutamine, 1 mmol/L sodium pyruvate, 25 mmol/L HEPES, 50 mmol/L 2-ME, and combined antibiotics (Invitrogen Life Technologies). On day 14 of TIL initiation, the lymphocytes were washed with PBS, resuspended in PBS supplemented with 0.5% BSA, and stained with FITC-conjugated HLA-A*0201/MART-126–35 dextramer (Immudex, Copenhagen, Denmark) for 30 min at 4°C. The lymphocytes were then incubated with allophycocyanin-conjugated mouse anti-human CD8 (eBioscience) for an additional 30 min at 4°C and washed. CD8+ lymphocytes, positively stained by the dextramer (CD8+/dextramer+ cells), were sorted by a BD FACSAria (BD Biosciences) and directly cloned at one or two cells/well in 96-well plates in the presence of ortho–anti-CD3 (30 ng/ml; eBioscience), rhIL-2 (6000 IU/ml), and 4 Gy-irradiated 5 × 104 allogeneic PBMCs as feeder cells. Five days later, rhIL-2 (6000 IU/ml) was added and renewed every 2 d thereafter. On day 14, the clones were assayed for IFN-γ secretion in a peptide-specific manner following their coincubation with MART-126–35–pulsed T2 cells (peptides were commercially synthesized and purified [>95%] by reverse-phase HPLC by Biomer Technology) using commercially available ELISA reagents (R&D Systems, Minneapolis, MN). The MART-126–35–reactive clones were further expanded in a second-round exposure to ortho–anti-CD3 (30 ng/ml) and (6000 IU/ml) rhIL-2 in the presence of 50-fold excess irradiated feeder cells. A similar protocol was performed to obtain a gp100154–162-reactive clone. Table II summarizes data on lymphoid cell lines used in this work. PBMCs were obtained from melanoma patients by cytopheresis, followed by centrifugation on Ficoll-Paque Plus gradient (Amersham, Uppsala, Sweden). Cells were cryopreserved until future use. Because melanoma-reactive T cells in the peripheral blood are of low frequency that is often beyond detection, a 12-d in vitro stimulation assay was used to increase their ratio. PBMCs were cultured for 12 d in the presence of irradiated autologous melanoma cells. A MUC-163–71–specific T cell line was generated from melanoma patient PBMCs by repeated peptide stimulation, as described (21). The mouse mAb 225.28, which recognizes chondroitin sulfate proteoglycan 4 (CSPG4), was developed and characterized, as described (22). Allophycocyanin-conjugated mouse anti-human NG2/MCSP (CSPG4) (R&D Systems), mouse anti-human HMB45 (Serotec, Oxford, U.K.), FITC-conjugated mouse anti-human CD146, FITC-conjugated rat anti-human CD8 Ab (Serotec), FITC- or allophycocyanin-conjugated mouse anti-human CD8, PE- or FITC-conjugated mouse anti-human CD4, PE-conjugated mouse anti-human IFN-γ, FITC- conjugated mouse anti-human CD107A (LAMP-1) (all from eBioscience, San Diego, CA), Pacific blue–conjugated mouse anti-human CD107 (BioLegend), allophycocyanin-mouse anti-human CD137 (BD Pharmingen), and allophycocyanin or DyLight 649-conjugated donkey anti-mouse IgG (Jackson ImmunoResearch Laboratories, West Grove, PA) were purchased from the indicated companies. Lymphocytes were cocultured with melanoma cells (1–5 × 105 lymphocytes/well in 200 μl final vol) in U-shape 96-well plates in a 1:1 E:T ratio. Where specified, peptide-pulsed (1 μg/ml) T2 cells were cocultured with the lymphocytes. Following incubation for 2 h at 37°C, cells were washed twice in FACS buffer consisting of PBS supplemented with 0.5% BSA and 0.09% sodium azide. Ag transfer was monitored by concomitant staining of cells with the indicated Abs for 30 min at 4°C, followed by washing in FACS buffer. Unconjugated Abs were labeled with a secondary Ab. The percentage of melanoma Ag imprinting was defined as percentage of melanoma-Ag+CD8+ cells, gated on lymphocytes, following doublets exclusion (23). The gating strategy is shown in Supplemental Fig. 1. In the indicated experiments, 1 × 105 cells of the four following cell lines were cocultured in the same wells: MART-126–35–reactive T cells (2D6), a nonrelevant MUC-163–71–specific T cell line (line 33), melanoma cells (526mel), and MUC-163–71 peptide-pulsed T2 cells (used for activation of the MUC-1–specific T cells). Following incubation for 2 h at 37°C, cells were washed twice with FACS buffer and labeled with the indicated Abs. To enable separate gating, the two lymphocyte populations were prelabeled with PKH67 (anti–MART-1, green; Sigma-Aldrich) and PKH26 (anti-MUC1, red; Sigma-Aldrich), according to the manufacturer's instructions. In other experiments, PKH26-labeled MART-126–35–reactive T cells (2D6) were mixed at different ratios with a nonrelevant MUC-163–71–specific T cell line (line 33) prelabeled with Cell Proliferation Dye eFluor 450 (eBioscience; according to manufacturer's instructions, 1 × 105 total lymphocytes in the culture). The cell mix contained a rising percentage of MUC-1–specific lymphocytes and a complementary decreasing percentage of MART-1–specific T cells. The lymphocyte mix was cocultured with melanoma cells (M579-A2) at a 1:1 E:T ratio. Following incubation for 2 h at 37°C, cells were washed twice with FACS buffer and labeled simultaneously with the indicated Abs. For intracellular cytokine assay, lymphocyte and melanoma cells were cocultured 1:1 for 6 h at 37°C. Cytofix/Cytoperm Plus Kit with Brefeldin A (eBioscience) was used according to the manufacturer’s recommendations. Brefeldin A (10 μg/ml) was added for the last 4 h of coculture to enable intracellular proteins to accumulate. Then the cells were harvested, resuspended in FACS buffer, and surface stained with fluorophore-conjugated anti-CD8 mAbs for 30 min at 4°C. Following permeabilization with Cytofix/Cytoperm buffer, intracellular IFN-γ or TNF-α was detected with a mouse anti-human IFN-γ or TNF-α mAb, respectively (eBioscience). All samples were subjected to flow cytometry on a BD LSRII (BD Biosciences). The data were analyzed using FCS Express software (De Novo Software, Los Angeles, CA). Lymphocytes were cocultured with melanoma cells for 2 h at 37°C and labeled as described for the Ag capture assay. Images were obtained by a Zeiss LSM 510 META confocal microscope (Zeiss, Jena, Germany) and analyzed using LSM510 software version 3.2 (Zeiss). Following coincubation with melanoma cells, tumor Ag-positive CD8+ T cells and tumor Ag-negative CD8+ T cells from bulk PBMC or TIL population were sorted by BD FACSAria (BD Biosciences). Sorted cells were expanded in vitro with ortho-anti-CD3 (30 ng/ml) and rhIL-2 (6000 IU/ml) in the presence of 50-fold excess irradiated feeder cells. In vitro cytotoxicity assays were performed as described (24). Briefly, lymphocytes were washed, resuspended in complete medium, and mixed at different ratios (20:1, 10:1, 5:1, 2.5:1, and 1.25:1 E:T) with 5000 35S L-methionine–labeled melanoma cells. CTL assays were done in U-shaped microtiter wells at 37°C for 5 h, in a 5% CO2 atmosphere. Percentage of specific lysis was calculated as follows: percentage of lysis = ([cpm in experimental well − cpm spontaneous release]/[cpm maximal release − cpm spontaneous release]) × 100. Intracellular staining of cleaved caspase 3 was performed, as described (25). Briefly, melanoma cells were stained with CellTrace Far Red DDAO-SE (Life Technologies), according to the manufacturer’s protocol. Following repeated washing with PBS, CellTrace Far Red DDAO-SE–labeled melanoma cells were cocultured with effector lymphocytes for 1 h at a 1:1 ratio. The cells were then harvested and washed twice with PBS containing 1% BSA. Following fixation and permeabilization (according to eBioscience protocol), intracellular cleaved caspase-3 was labeled with rabbit anticleaved caspase-3-PE (BD Pharmingen) for 30 min at 4°C. Appropriate isotype control was used. Cells were washed twice with permeabilization buffer, resuspended in FACS buffer, subjected to flow cytometry, and analyzed, as above. Statistical analyses were performed with the Instat Biostatistics software (GraphPad Software, San Diego, CA). Pearson linear regression analysis was used for correlation studies and presented as R2 values. Paired t test was used for group comparisons. All p values are two sided and considered significant at the 0.05 level. During trogocytosis, membrane patches carrying an array of different molecules are transferred from target cells to immune effector cells. We hypothesized that trogocytosis enables the transfer of both cognate and noncognate tumor Ags. To test this possibility, we focused on defined proteins known to be melanoma specific. The melanosomal Ag gp100 (26), CSPG4 (27), and CD146 (melanoma cell adhesion molecule) (28) were selected because they are easily detected on melanoma cells using commercially available Abs (Fig. 1A). These Ags are normally not detected on T lymphocytes. Ag-specific T cell clones and lines acquire a variety of melanoma Ags by trogocytosis. (A) Expression of CSPG4 and gp100 on human melanoma cell lines was detected by flow cytometry using specific mAbs and FITC-conjugated secondary Ab. Expression of CD146 was detected using FITC-conjugated mouse anti-human CD146. Gray lines: secondary Ab alone or isotype control; black lines: anti-CSPG4, gp100, or CD146, as indicated. (B) The 1G2 (HLA-A2+/gp100154–162–reactive) T cell line was cocultured with HLA-A2+ (M579-A2 and 624mel) or HLA-A2− (M171 and M579) melanoma cells. CSPG4 was detected on CD8+ lymphocytes by staining with specific mAbs, followed by flow cytometry. 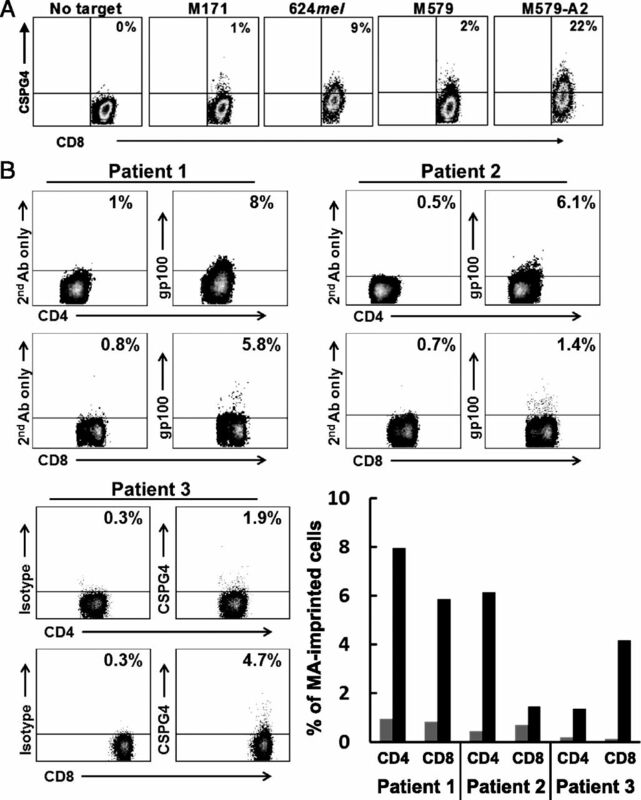 (C) The 2E2, 2C7, and 1H8 (all A2/MART-126–35–reactive) T cell clones were cocultured and analyzed, as described in (B). (D) The 1H8 T cell clone was cocultured with melanoma cell lines, as described in (B). Presence of gp100 and CD146 on CD8+ cells was monitored by flow cytometry. One representative experiment of five performed is shown. 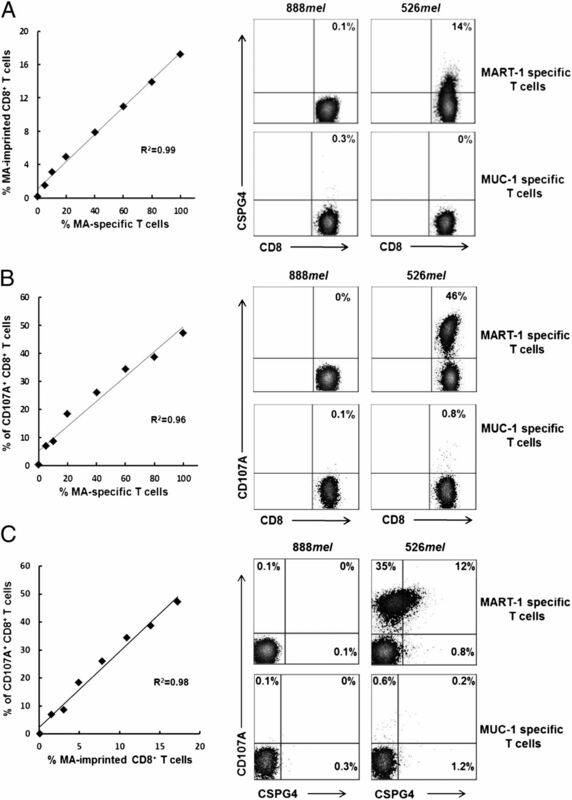 (E) The four following cell lines were cocultured: MART-126–35–reactive T cells (2D6), a nonrelevant MUC-163–71–specific T cell line (line 33), melanoma cells (526mel), and MUC-163–71 peptide-pulsed T2 cells. CSPG4 and CD107A were detected on CD8+ lymphocytes by staining with specific mAbs, followed by flow cytometry. To enable separate gating, the two lymphocyte populations, 2D6 and line33, were prelabeled with PKH67 and PKH26, respectively. To follow the trogocytosis of melanoma Ags, we cocultured melanoma targets (Table I) with melanoma-specific CTLs (Table II). Fig. 1B shows capture of CSPG4 by gp100154–162-specific T cells (line 1G2). Note that even though 1G2 cells are gp100 specific, they capture CSPG4 when coincubated with either 624mel or M579-A2, HLA-A2–matched melanoma cells (22 and 50% CSPG4+/CD8+ cells, respectively). The 1G2 lymphocytes cocultured with HLA-A2–negative (HLA-A2−) melanoma cells (M171 and M579) did not stain for the Ag. Similar results were obtained when Ag transfer was monitored by using three TIL-derived clones specific for MART-126–35 (2E2, 2C7, and 1H8). A considerable percentage of CSPG4+-imprinted CD8+ lymphocytes was detected following incubation with M579-A2 melanoma cells (ranging from 10 to 70%) (Fig. 1C). We confirmed that melanoma Ag detection on T cells is not unique to CSPG4 by analyzing two additional melanoma Ags: gp100 and CD146 (Fig. 1D). Because CD146 has been previously detected on a small subset of effector memory lymphocytes in the peripheral blood (29), we verified that this Ag was not endogenously expressed on resting or activated lymphocytes (data not shown). To ascertain that trogocytosis is not the result of cell activation per se, we evaluated trogocytosis by activated nonmelanoma-specific T cells that were mixed with melanoma-specific T cells and MHC-matched melanoma cells. The results (Fig. 1E) demonstrate that, whereas melanoma-specific T cells capture CSPG4, activated MUC-1–specific T cells do not acquire the tumor Ag. These results confirm that only the melanoma-specific lymphocytes in the mixture acquire Ag. The observation that melanoma-imprinted lymphocytes could be directly detected by double staining was also confirmed by confocal microscopy, using anti-CSPG4 and anti-gp100 Abs in conjunction with anti-CD8 (Fig. 2). Coculturing with HLA-A2–matched melanoma cells (Fig. 2A–C), but not with HLA-A2–mismatched melanoma cells (Fig. 2D), revealed a red-dotted staining of melanoma Ag–imprinted CTLs. Ag-specific T cells acquire melanoma Ags by trogocytosis. (A–C) Confocal microscopy of melanoma Ag–imprinted CD8+ T cell clones after coincubation with HLA-A2–matched melanoma. (A) Capture of gp100; (B, C) capture of CSPG4. (D) Coculture of T cell clones with HLA-A2–mismatched melanoma. Green, CD8+ lymphocytes; red, gp100 or CSPG4 on melanoma cells and imprinted lymphocytes. Arrows point to tumor Ag on lymphocytes. Scale bars for (A–C), 10 μM; (D), 20 μM. These results demonstrate that T cells with different antigenic specificities decorate themselves with an array of melanoma Ags as the result of T cell–tumor interaction. In the aforementioned experiments, we used melanoma Ag-specific T cell clones that are homogenous in their antigenic specificity and therefore an easier system to demonstrate a subtle phenomenon. However, PBLs of melanoma patients are often characterized by low frequency of melanoma-reactive cells. We therefore asked whether Ag transfer could be detected in PBLs following trogocytosis with autologous melanoma cells. To ensure that melanoma-reactive T cells go beyond the detection threshold, they were stimulated in vitro with autologous melanoma cells for 12 d. Under such circumstances, a patient’s PBL acquired expression of melanoma Ags (Fig. 3A, 3C). CSPG4 was detected on 19% of in vitro expanded CD8+ T cells (Fig. 3A). This relatively high proportion of CSPG4-imprinted T cells postexpansion reflects a 20-fold increase in their frequency. This outcome demonstrates the efficacy of a single melanoma Ag to expose the diverse population of melanoma-expanded T cells. In another experiment with a different patient, the 12-d coculture assay resulted in preferential expansion of CD4+ T cells (Fig. 3B, 3C), thus providing an opportunity to evaluate trogocytosis of tumor Ag by CD4 lymphocytes. The latter cells exhibited hyperreactivity against the tumor as measured by IFN-γ secretion (Fig. 3B), and 38% of them were imprinted with CSPG4 (Fig. 3C). Class II expression in melanoma M579 was confirmed by flow cytometry (Supplemental Fig. 2). These findings indicate that patient's PBLs contain tumor Ag-specific CD8 and CD4 effectors that could be identified by staining of the acquired tumor Ags and expanded for potential therapeutic use. CD8+ and CD4+ bulk lymphocyte populations acquire melanoma Ag by trogocytosis. (A) PBMCs from melanoma patient 171 were cultured for 12 d in the presence of irradiated autologous melanoma (M171). Afterward, the cells were cocultured with autologous (M171) or irrelevant (624mel) melanoma cells. CSPG4 was monitored on CD8+ lymphocytes by staining with specific mAbs, followed by flow cytometry. (B) PBMCs from melanoma patient 579 were cultured for 12 d in the presence of irradiated autologous melanoma (M579). Afterward, the cells were cocultured with autologous (M579) or irrelevant (M171) melanoma cells. IFN-γ secretion of nonstimulated and 12-d–stimulated lymphocytes after restimulation with 624mel cells or autologous melanoma (M579, filled bar) was evaluated by ELISA. (C) Presence of CSPG4 was monitored on CD4+ lymphocytes derived from PBMCs (patient 579) 12 d after stimulation with autologous melanoma by staining with specific mAbs, followed by flow cytometry. Detection of melanoma Ag-specific T cells in patient's PBLs by trogocytosis requires their preincubation with melanoma cells. Unlike PBLs, TIL reside in the tumor and are therefore in close physical contact with cancer cells. Hence, lymphocytes derived from TIL may already carry melanoma Ags and be detectable as the most valuable cell population for clinical utility. To test whether TIL from melanoma patients can trogocytose melanoma Ags, we incubated archived TIL from two HLA-A2+ patients (412 and 209) with HLA-A2–matched or nonmatched melanoma cells. Fig. 4A shows that 22 and 9% of CD8+ T cells from TIL 412 stained positively for CSPG4 following incubation with HLA-A2+ M579-A2 and 624mel melanomas, respectively, compared to ≤2% with the control melanomas. Similarly, gp100 was detected on 3.7 and 2.8% of TIL 412 and 209, in comparison with <1% with nonmatched melanoma cells (Supplemental Fig. 3). The different frequencies of CSPG4 and gp100 detected could be due to their different densities on the melanoma cell lines or to a shorter window of expression on the lymphocytes. Using freshly acquired TIL, we could detect melanoma Ags on unexpanded lymphocytes as early as 4 d postsurgery, the time frame required to release an adequate amount of lymphocytes from the meshed tumor (Fig. 4B). There was no need to incubate fresh TIL with melanoma cells because the resected tumor tissue harbored both TIL and melanoma Ags. Fig. 4B summarizes data of gp100 and CSPG4 expression on CD8+ and CD4+ TIL in early cultures generated from fresh metastatic lesions removed from three melanoma patients. TIL acquire melanoma Ags from tumor cells. (A) TIL from melanoma patient 412 were cultured for 12 d in the presence of irradiated autologous melanoma. Expanded cells were cocultured with HLA-A2–matched melanoma (624mel, M579-A2) or HLA-A2–mismatched melanoma cells (M171, M579). CSPG4 was monitored on CD8+ lymphocytes by staining with specific mAbs, followed by flow cytometry. One representative experiment of three performed is shown. (B) Melanoma Ags gp100 (in patients 1 and 2) and CSPG4 (in patient 3) were monitored on CD4+ and CD8+ TIL 4 d after tumor resection from the patient (the minimal time required for TIL expansion in the culture medium). Cells were stained with specific mAbs, followed by flow cytometry. Dot plots are the results of tumor Ag and background staining for each individual patient. Bars summarize the data from all three patients. Gray bars represent background staining with secondary Ab only (patients 1 and 2) or with isotype (patient 3). Black bars represent specific staining with anti-melanoma Ag-specific Ab. To assess the functional relevance of Ag imprinting of tumor-reactive lymphocytes, Ag capture was compared with antitumor reactivity of a given T cell clone. Reactivity was measured by surface expression of the degranulation marker CD107A on CD8+ cells. For this purpose, MART-126–35–reactive T cells (clone 2D6) were mixed, at different ratios, with nonrelevant MUC-163–71–specific T cells (line 33) and cocultured with melanoma cells. To distinguish between melanoma-specific and nonspecific T cells, each T cell population was prelabeled with a different cell tracker, as specified in Materials and Methods. Tumor Ag capture and lymphocyte cytolytic activity were analyzed based on concomitant staining of CSPG4 and CD107A on CD8+ T cells. Fig. 5A and 5B shows results of CSPG4 imprinting and CD107A expression (respectively) in melanoma-Ag–specific CD8 cells. A linear correlation (R2 = 0.99, p < 0.0001) was recognized between the percentage of Ag-imprinted cells and the percentage of melanoma Ag-specific cells in the culture (Fig. 5A, left panel). A dot plot showing results from a representative lymphocyte concentration is shown (Fig. 5A, right panel). A similar result was obtained for CD107A expression (R2 = 0.96, p < 0.0001; Fig. 5B). These data demonstrate that the percentage of CSPG4+/CD8+ and CD107A+/CD8+ cells correlates with the frequency of Ag-specific CD8+ T cells. When the percentage of CSPG4+/CD8+ cells was compared with the percentage of CD107A+/CD8+ cells by regression analysis, a strong linear correlation (R2 = 0.98, p < 0.0001) between the parameters was found (Fig. 5C, left panel). A dot plot showing results from a representative lymphocyte concentration is shown (Fig. 5C, right panel). These results show that tumor Ag imprinting of CD8+ T cells correlates with cytolytic activity of melanoma-reactive T cells. 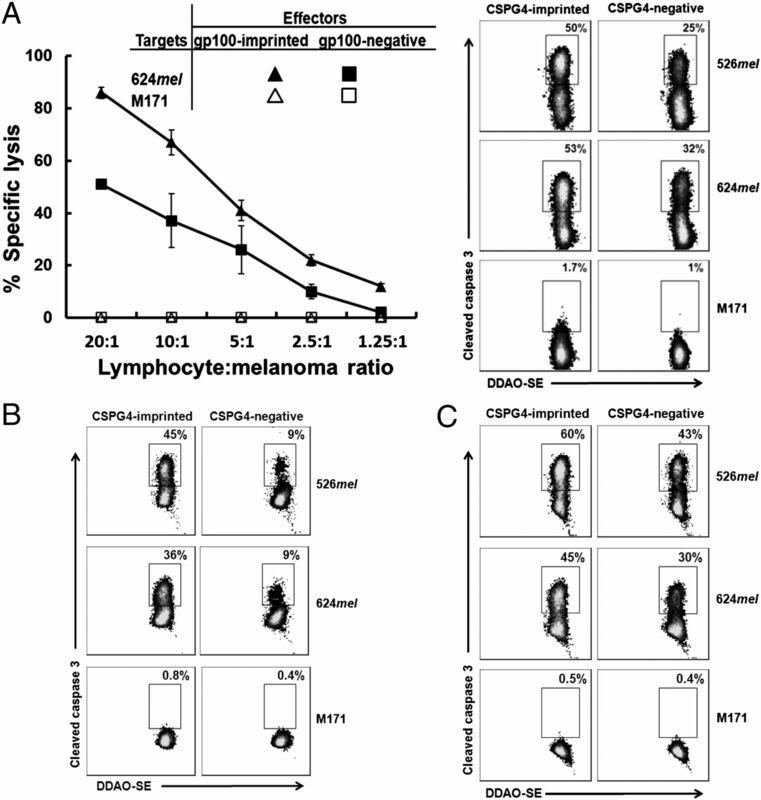 Melanoma Ag imprinting of CD8+ cells correlates with antitumor T cell function. MART-126–35–specific T cells (clone 2D6) were mixed with melanoma-nonrelevant, MUC-163–71–specific T cells (line 33) at the indicated ratios and cocultured with HLA-A2–matched melanoma cells (526mel) or irrelevant melanoma cells (888mel). (A) The percentage of CSPG4+/CD8+ melanoma Ag (MA)–imprinted cells of total CD8+ cells was correlated to the proportion of melanoma Ag-specific cells in the culture (MA-specific cells, R2 = 0.99, p < 0.0001) (left panel). A representative dot plot of a cell mixture consisting of 60% 2D6 clone and 40% line 33 cocultured with the indicated melanoma is presented (right panel). (B) The percentage of CD107A+/CD8+ cells of total CD8+ cells was correlated to the proportion of melanoma Ag-specific cells in the culture (R2 = 0.96, p < 0.0001) (left panel). A representative dot plot of a cell mixture consisting of 60% 2D6 clone and 40% line 33 cocultured with the indicated melanoma is shown (right panel). (C) The percentage of CSPG4+/CD8+ cells was correlated to the percentage of CD107A+/CD8+ cells (R2 = 0.98, p < 0.0001) (left panel). A representative dot blot of a cell mixture consisting of 60% 2D6 clone and 40% line 33 cocultured with the indicated melanoma is presented (right panel). One representative experiment of three is shown. To examine whether Ag imprinting can identify tumor Ag–reactive T cells, TIL from three melanoma patients were sorted to obtain CSPG4-imprinted CD8-positive (CSPG4+/CD8+) and CSPG4−/CD8+ cells. Sorted cells were expanded, cocultured with HLA-A2–matched (526mel) or irrelevant (888mel) melanoma cells, and analyzed for intracellular cytokine production. As shown in Fig. 6A (left panel), 21% of CSPG4-imprinted CTL produced IFN-γ when stimulated with HLA-matched melanoma cells, compared with only 3.5% among the CSPG4-negative/CD8+ population. Enrichment of cells expressing TNF-α in the CSPG4-imprinted/CD8+ population was also detected (10 and 2% for imprinted and negative cells, respectively; Fig. 6A, right panel). Similar results were obtained for two additional melanoma patients (Fig. 6B, 6C). Melanoma Ag imprinting is associated with increased production of cytokines. TIL from three melanoma patients, M431, M412, and M209 (A, B, and C, respectively), were stimulated for 12 d with HLA-A2–matched melanoma cells and sorted to CSPG4 imprinted (CSPG4+/CD8+) and CSPG4 negative (CSPG4−/CD8+) by flow cytometry. Sorted cells were expanded in the presence of anti-CD3 Ab, cocultured with HLA-A2–matched melanoma (526mel) or irrelevant (888mel) melanoma cells, and analyzed for IFN-γ and TNF-α secretion by intracellular staining. The results of one of three experiments are shown. To examine whether comparable enrichment could be achieved using bulk PBMC, lymphocytes from a melanoma patient were sorted to obtain CSPG4-imprinted/CD8+ and CSPG4-negative/CD8+ cells. Sorted cells were expanded as above, cocultured with autologous (M171) or irrelevant (624mel) melanoma cells, and analyzed for CD137 expression and CD107A mobilization. As shown in Supplemental Fig. 4A (left panel), 63% of CSPG4+/CD8+ cells expressed CD137 when stimulated with the autologous melanoma cells, compared with 37% among the CSPG4−/CD8+ population. Similarly, enrichment of cells expressing the degranulation marker CD107A in the CSPG4+/CD8+ population was observed (Supplemental Fig. 4A, right panel). In parallel with the activation markers, percentage of IFN-γ and TNF-α–producing CTL increased from 17 to 41% and from 6 to 12%, respectively (Supplemental Fig. 4B). To determine whether tumor Ag imprinting is useful for identifying highly functional lymphocytes, we evaluated the differential antitumor cytotoxic activity of trogocytosing versus nontrogocytosing lymphocytes. To this end, TIL from a melanoma patient were sorted to yield gp100-imprinted (gp100+/CD8+) and gp100-negative (gp100−/CD8+) cells. Following cell expansion, the two lymphocyte populations were coincubated with HLA-A2–matched melanoma cells (624mel) and tested for their cytotoxic activity. The results of a [35S]methionine release assay showed augmented killing of HLA-A2–matched melanoma by gp100-imprinted compared with gp100-negative lymphocytes (Fig. 7A, left panel). TIL from the same melanoma patient were sorted based on imprinting by another melanoma Ag, CSPG4. Cytotoxic activity of CSPG4-imprinted versus CSPG4-negative CD8+ lymphocytes was assessed based on the expression of cleaved caspase-3 in target cells (25). As shown in Fig. 7A (right panel), CSPG4-imprinted CTL exhibited superior killing of 526mel and 624mel, compared with CSPG4-negative lymphocytes. Furthermore, we performed trogocytosis-based sorting of TIL from two additional melanoma patients, followed by comparative analysis of antimelanoma CTL activity. In line with the results shown above, sorting of T cells on the basis of their imprinting by tumor Ag resulted in selection of highly functional CTLs with augmented antimelanoma cytotoxicity (Fig. 7B, 7C). Taken together, these results demonstrate that detection of tumor compounds on TIL and/or PBMC enables identification of highly reactive antimelanoma T cells and could be exploited for their sorting and in vitro expansion. Lymphocytes isolated on the basis of melanoma Ag imprinting have improved antitumor cytotoxic activity. (A) TIL from melanoma patient 209 (M209) were sorted to gp100-positive and gp100-negative CD8+ T cells by flow cytometry. Sorted cells were expanded and cocultured with HLA-A2–matched (624mel) or irrelevant (M171) melanoma cells. Percentage of specific lysis of target melanoma cells was measured using a [35S] release-based cytotoxicity assay (p = 0.016, left panel). 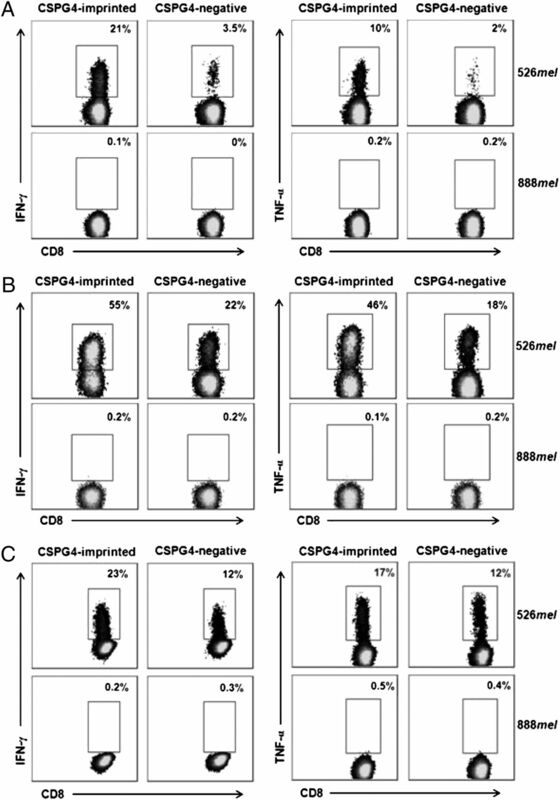 TIL from M209 were sorted to CSPG4 imprinted (CSPG4+/CD8+) and CSPG4 negative (CSPG4−/CD8+) by flow cytometry. Cells were cocultured with HLA-A2–matched (526mel, 624mel) or irrelevant (M171) melanoma cells. The level of intracellular cleaved caspase-3 in melanoma cells was measured by flow cytometry (right panel). (B) As for (A), level of cleaved caspase-3 in melanomas was measured after incubation with sorted TIL M431 or (C) with sorted TIL M412. The results of one of three experiments are shown. In the current study, we show that melanoma-reactive T cells acquire unprocessed tumor Ags by trogocytosis when interacting with their cognate tumor. In this manner, tumor-reactive T cells are temporarily imprinted with tumor components that can be easily detected by specific Abs. The question ensuing is whether this biological phenomenon can be exploited for T cell–based immunotherapy. To this end, we identified and isolated melanoma-reactive T cells on the basis of tumor-Ag imprinting. This detection method was applicable to lymphocytes of various sources, including T cell clones, PBMC, and archived and fresh TIL populations. Both CD4 and CD8 T cells were imprinted with melanoma Ags following engagement with tumor targets. Most importantly, tumor-imprinted lymphocytes were functionally superior in comparison with their nonimprinted counterparts as determined by cytokine secretion and antimelanoma cytotoxicity. In this regard, our observation that imprinted T cells, albeit in low numbers, were identified in TIL shortly after extraction from the tumor is encouraging, because these are the T cells most likely to possess therapeutic potential for adoptive cell transfer. The prototypical method to produce TIL for clinical administration relies on the selection of tumor-reactive T cells based on IFN-γ secretion, followed by further expansion. This process is time consuming, and does not guarantee that IFN-γ secretion originates from the majority of the selected cells. If it originates only from a few of them, a portion of the expanded cells is not significant for the treatment success. To shorten the time required for TIL growth, Tran et al. (30, 31) used young TIL without screening for specific tumor recognition in a markedly simplified process and with improved phenotypic attributes. Although minimally cultured young TIL survive longer, the low proportion of T cells capable of tumor recognition offsets the benefit of their improved viability. In the present work, we show that tumor-imprinted fresh TIL could be identified at day 4 posttumor resection. Because we show that trogocytosing T cells constitute a subset with upgraded antitumor properties, isolation and expansion of TIL obtained by trogocytosis from early tumor resections could prove to be a valuable tool to enhance the efficacy of adoptive cell transfer. Previous studies documenting some aspects of trogocytosis entailed the labeling or modification of target cells. Lipophilic dyes (8, 15, 32, 33), biotin (15, 16, 23), and genetic engineering of the target cell to produce fluorescent peptide–MHC complexes were used to study trogocytosis (34–36). As an alternative to these manipulations, we propose to rely on the pool of Abs against tumor Ags, which are familiar, available, and easy to use for most immunologists. The advantage of skipping the coculture step in the lymphocyte-imprinting process is unique to TIL, with the outcome being that young TIL assays could be further improved. Whereas this work deals with the early identification of tumor-reactive T cells capitalizing on their ability to perform trogocytosis, Ag imprinting adds a new power to T cells: Ag presentation. In addition to mechanisms used by professional APCs, that is, direct and cross-presentation, trogocytosis and its resultant Ag imprinting is a novel avenue of Ag presentation (37). Because trogocytosis is typically performed by immune effector cells, it expands the repertoire of cells that can function as APCs. The implications of trogocytosis extend beyond Ag imprinting and include the acquisition of new functions endowed by the snatched biomolecules. In line with previous studies, which focused on immune-modulating molecules, Gary et al. (11) showed that Ag-specific CD8+ T cells acquire the coinhibitory programmed death ligand 1 from mature dendritic and tumor cells. While doing so, the lymphocytes induce apoptosis on neighboring programmed cell death 1–expressing CD8+ T cells. Similarly, the tolerogenic molecule HLA-G, when acquired by T and NK cells, provides them with regulatory functions (35). Interestingly, trogocytosis was exploited in a transient protein–transfer assay to endow recipient cells with a new chemotactic function (38). Limited information is available regarding the actual transfer of tumor Ags from tumor cells to lymphocytes by way of trogocytosis. Gary et al. (11) documented the transfer of melanoma cell surface Ag (MCSP/CSPG4) to CD8 T cells, and Stern-Ginossar et al. (36) showed the transfer of carcinoembrionic Ag to NK cells interacting with tumor cells. Until now, the consequences of tumor Ag transfer have not been explored; the transformation of lymphocytes to secondary APC is currently under research in our laboratory. In summary, we present data showing that the detection of tumor Ags on the surface of T cells by Ab staining may serve as a tool for isolation of highly reactive antitumor effector lymphocytes. This approach may be applied for research regarding new functions acquired by trogocytosing cells, for immunomonitoring of antitumor treatment, and possibly for improving immunotherapeutic modalities, such as adoptive cell therapy. We thank James C. Yang, M.D., from the Surgery Branch, National Cancer Institute, National Institutes of Health, for discussing the idea behind this study. We appreciate the help of Orna Harel, Ph.D., in editing the manuscript. We thank Inna Ben David, Anna Kuznetz, and Yael Gelfand for skilled technical work. ↵1 A.M. and M.L. share senior authorship of this work. This work was supported by the Dr. Miriam and Sheldon G. Adelson Medical Research Foundation, the United States–Israel Binational Science Foundation, the Israel Cancer Association, the Chief Scientist of the Israel Ministry of Health (Grant 4886), and a Perlstein Family donation. This work was also supported by Public Health Service Grants RO1 CA110249 and RO1 CA138188 awarded by the National Cancer Institute.
. 1999. TCR-mediated internalization of peptide-MHC complexes acquired by T cells. Science 286: 952–954.
. 2001. The immunological synapse of CTL contains a secretory domain and membrane bridges. Immunity 15: 751–761.
. 1973. Transfer of antigen from macrophages to lymphocytes. II. Immunological significance of the transfer of lipopolysaccharide. Immunology 24: 831–840.
. 2007. Immune regulation by pretenders: cell-to-cell transfers of HLA-G make effector T cells act as regulatory cells. Blood 109: 2040–2048.
. 2007. Trogocytosis-based generation of suppressive NK cells. EMBO J. 26: 1423–1433.
. 2002. Synaptic transfer by human gamma delta T cells stimulated with soluble or cellular antigens. J. Immunol. 168: 6336–6343.
. 2005. Profiling blood lymphocyte interactions with cancer cells uncovers the innate reactivity of human gamma delta T cells to anaplastic large cell lymphoma. J. Immunol. 174: 1717–1722.
. 2006. A very rapid and simple assay based on trogocytosis to detect and measure specific T and B cell reactivity by flow cytometry. Eur. J. Immunol. 36: 779–788.
. 2011. 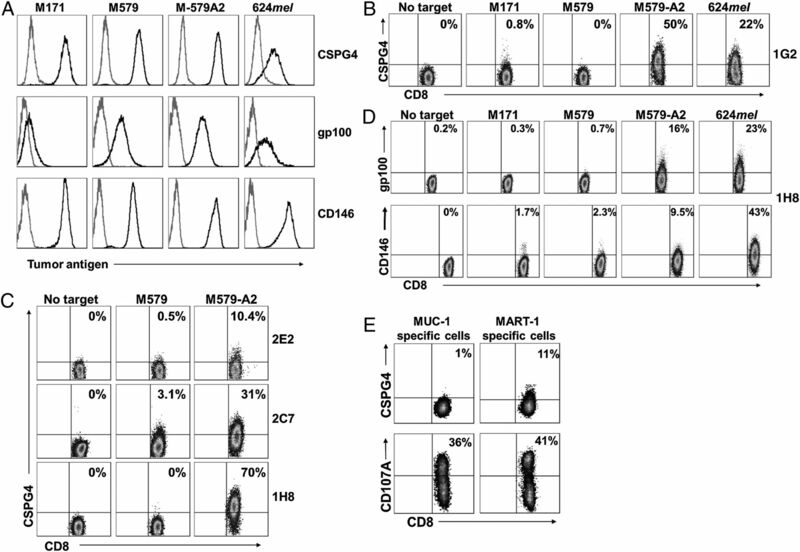 Presentation of acquired peptide-MHC class II ligands by CD4+ regulatory T cells or helper cells differentially regulates antigen-specific CD4+ T cell response. J. Immunol. 186: 2148–2155.
. 2012. Antigen-specific transfer of functional programmed death ligand 1 from human APCs onto CD8+ T cells via trogocytosis. J. Immunol. 188: 744–752.
. 2002. Acquisition of CD80 by human T cells at early stages of activation: functional involvement of CD80 acquisition in T cell to T cell interaction. J. Immunol. 169: 6162–6169. Brown, R., K. Kabani, J. Favaloro, S. Yang, P. J. Ho, J. Gibson, P. Fromm, H. Suen, N. Woodland, N. Nassif, et al. 2012. CD86+ or HLA-G+ can be transferred via trogocytosis from myeloma cells to T cells and are associated with poor prognosis. Blood 120: 2055–2063.
. 2010. Membrane redistributions through multi-intercellular exchanges and serial trogocytosis. Cell Res. 20: 1239–1251.
. 2008. Capture of tumor cell membranes by trogocytosis facilitates detection and isolation of tumor-specific functional CTLs. Cancer Res. 68: 2006–2013.
. 2006. Quantifying viable virus-specific T cells without a priori knowledge of fine epitope specificity. Nat. Med. 12: 1208–1212.
. 2001. Cutting edge: CTLs rapidly capture membrane fragments from target cells in a TCR signaling-dependent manner. J. Immunol. 166: 3645–3649.
. 2007. Activation-induced expression of CD137 permits detection, isolation, and expansion of the full repertoire of CD8+ T cells responding to antigen without requiring knowledge of epitope specificities. Blood 110: 201–210.
. 1989. Tumor-specific cytolysis by lymphocytes infiltrating human melanomas. J. Immunol. 142: 3714–3725.
. 2003. Stimulation of tumor-reactive T lymphocytes using mixtures of synthetic peptides derived from tumor-associated antigens with diverse MHC binding affinities. J. Immunol. Methods 276: 103–119.
. 1981. Distribution and molecular characterization of a cell-surface and a cytoplasmic antigen detectable in human melanoma cells with monoclonal antibodies. Int. J. Cancer 28: 293–300.
. 2006. A simple trogocytosis-based method to detect, quantify, characterize and purify antigen-specific live lymphocytes by flow cytometry, via their capture of membrane fragments from antigen-presenting cells. Nat. Protoc. 1: 2536–2542.
. 2005. Combined dendritic cell cryotherapy of tumor induces systemic antimetastatic immunity. Clin. Cancer Res. 11: 4955–4961.
. 2005. A sensitive flow cytometry-based cytotoxic T-lymphocyte assay through detection of cleaved caspase 3 in target cells. J. Immunol. Methods 304: 43–59.
. 2000. Recognition of shared melanoma antigens in association with major HLA-A alleles by tumor infiltrating T lymphocytes from 123 patients with melanoma. J. Immunother. 23: 17–27.
. 2008. Cancer immunotherapy targeting the high molecular weight melanoma-associated antigen protein results in a broad antitumor response and reduction of pericytes in the tumor vasculature. Cancer Res. 68: 8066–8075.
. 2007. Immunization against MUC18/MCAM, a novel antigen that drives melanoma invasion and metastasis. [Published erratum appears in 2007 Gene Ther. 14: 382.] Gene Ther. 14: 316–323. 2007. A unique population of effector memory lymphocytes identified by CD146 having a distinct immunophenotypic and genomic profile. BMC Immunol. 8: 29.
. 2008. Minimally cultured tumor-infiltrating lymphocytes display optimal characteristics for adoptive cell therapy. J. Immunother. 31: 742–751.
. 2011. Establishment and large-scale expansion of minimally cultured “young” tumor infiltrating lymphocytes for adoptive transfer therapy. J. Immunother. 34: 212–220.
. 2010. The direction of plasma membrane exchange between lymphocytes and accessory cells by trogocytosis is influenced by the nature of the accessory cell. J. Immunol. 184: 1897–1908.
. 2007. Capture of target cell membrane components via trogocytosis is triggered by a selected set of surface molecules on T or B cells. J. Immunol. 178: 3637–3647.
. 2009. Ligand binding but undetected functional response of FcR after their capture by T cells via trogocytosis. J. Immunol. 183: 6102–6113.
. 2010. Different functional outcomes of intercellular membrane transfers to monocytes and T cells. Cell. Mol. Life Sci. 67: 1133–1145.
. 2007. Intercellular transfer of carcinoembryonic antigen from tumor cells to NK cells. J. Immunol. 179: 4424–4434.
. 2011. Cross-dressed dendritic cells drive memory CD8+ T-cell activation after viral infection. Nature 471: 629–632.